Iru Mugan, based on the storyline that how a special agent stops a dangerous criminal and avenges the murder of his wife. Directed by Anand Shankar, this Tamil movie stars Vikram, Nayanthara and Nithya Menon in the main role and Nassar, Thambi Ramaiah, Bala, Riythvika and Karunakaran in supporting roles. 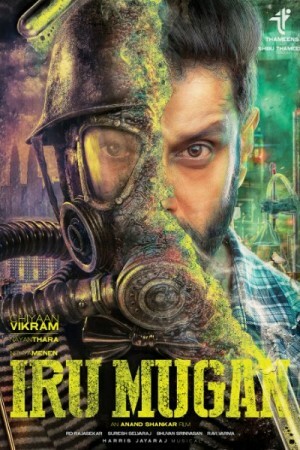 A transgender mad-scientist Love (played by Vikram) makes a drug that when inhaled turns ordinary men into superhumans. Ex RAW Agent Akilan (Vikram), with the help of a trainee officer makes it the mission of his life to stop Love from selling that super drug to the terrorist organizations in Malaysia.